The symbol of grounding and harmony is the flower of life. Flower of Life Murals have a harmonizing and organizing effect on all areas of life. that all life and consciousness springs from a source. It is therefore referred to as the original pattern, since the formation of the flower of life (as it is also called) begins with a circle. Another 6 steps are identical to the cell division of all life forms. Like a stencil you can find on it the intersections of all other sacred geometry symbols. Flower of Life "The Spirit in Harmony"
If one considers that the oldest representation of the flower of life is about 5000 years old and the representation of the geometric ornament fascinates until today mankind and not forgotten, then this can be explained only with a mystical attraction, but also with universal laws. If you take a closer look at the structure of the flower of life, then you will find that the geometric shapes point to all laws of nature. The outer circle or ring symbolizes our life cycle and is related to cell division, the origin of life. Out of this outer circle, the next, also called fish bubble, develops. Through the meeting and the intersection of the circles the actual creation arises and a third being emerges. 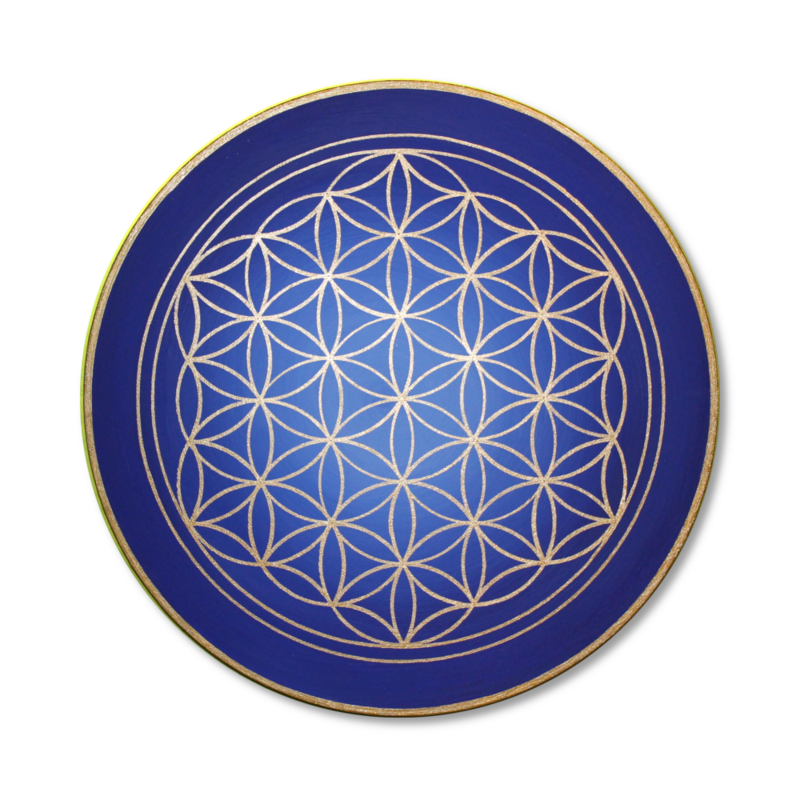 The flower of life Meaning of the third circle can be interpreted quite differently. So you can see the life cycle in it from birth through life to death. But also the individual stages of life starting from the past through the present to the future can be found again. After the third circle join the fourth and fifth, in which the four elements or the five fingers of the hand can be reflected. There are innumerable possibilities of interpretation, but they all have one thing in common: the inner connectedness of life and mind as part of the infinite vastness of the universe. What else can you get with us around the Flower of Life? With us you can buy various hand-painted flower of life pictures. These are painted by us personally on canvas for you. Of course, we also have many more powerful motifs from sacred geometry and other powerful symbols for you :-). The flower of life is applied by us based on sacred geometry. So we do not use a template or something similar. So you do not get a flower of life wall decal but a real painting! Through our many years of experience (since 2010 we paint this kind of pictures) we have already experienced a lot and can also respond to individual requests.